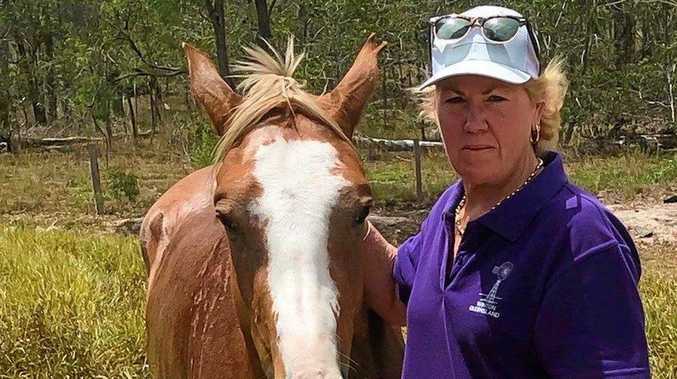 Dallarnil's Joanne Wease said she was traumatised after finding her horse had been mauled by a dog. 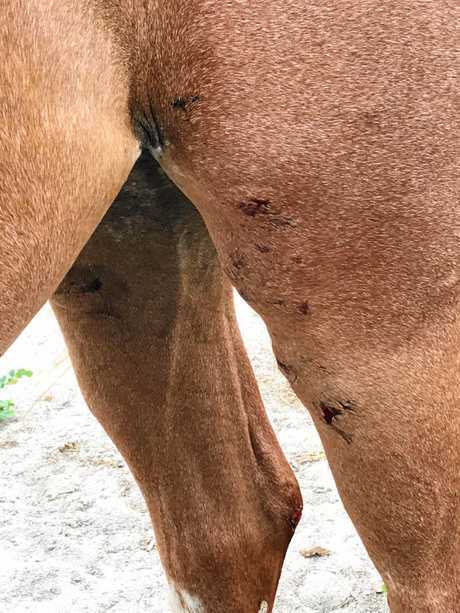 WHEN Dallarnil's Joanne Wease returned from a two hour shopping trip on Friday, she was traumatised to find her three-year-old horse Phoebe had been mauled by a dog. The attack, which occurred on Eureka Rd, left Phoebe unable to walk for days and in need of pricey medication. "We went down to take her rug off in case it rained and when I saw her ... she'd been mauled, and obviously by a dog," Mrs Wease said. 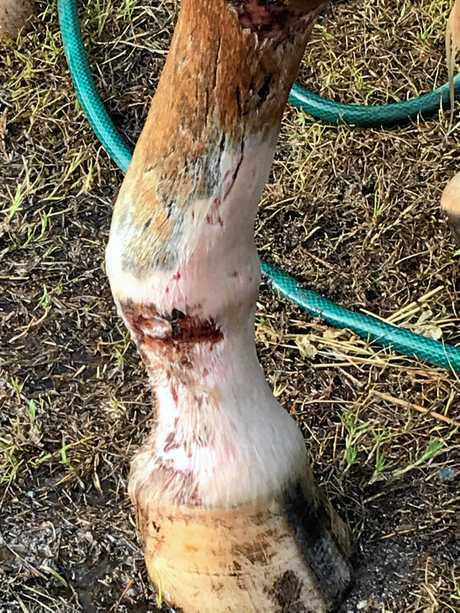 "Every leg has had skin ripped off, one of her legs is like a balloon, and she'd obviously had a fall because underneath her chin was all grazed. "It was traumatising to find her like that, we're still distraught, and she is traumatised too." Phoebe was in so much pain she was let unable to walk. The family believe a pig dog is to blame. "If it was a dingo it would have killed her, and it wouldn't have been a dingo pup because they don't breed until around April or May," Mrs Wease said. "We do have a few stray dogs around here so we can't say for certain whether it was a pig dog, a stray or a dingo but it had to have been a bigger dog. "And it would been kicked in the head by her." Puncture marks from the dog. Surrounded by large properties, the Wease family are only on 25 acres and were surprised their animals were targeted by the predator. "We've contacted a neighbour who is on a larger property and can bait for dingos, and we've told him he might want to bait," Mrs Wease said. 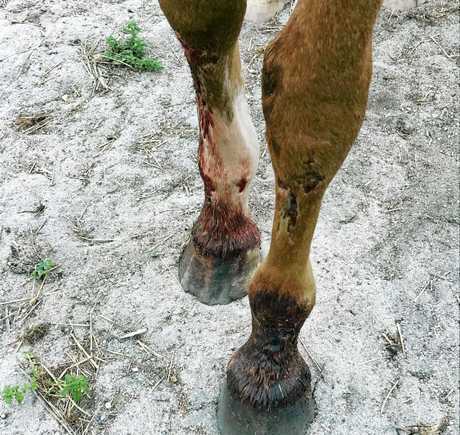 "Another lady up on Guppys Rd had her horse mauled by dogs last year too." When asked, last month, whether the frequency of attacks showed a need for more active intervention, North Burnett Regional Council said it was working with the public "to ensure the safety of community members and education of owners on the responsibility of pet ownership". "There are processes and laws that govern the way council deals with irresponsible pet owners and their nuisance pets," Mayor Rachel Chambers said. "Last year our officers responded to 305 service requests resulting in 319 enforcement actions. "Council acknowledges that whilst the majority of dogs living within the region are well behaved, high risk or nuisance dogs will not be tolerated." Phoebe could not walk for days. After a trip to the vet for $200 worth of medication, Mrs Wease is treating Phoebe with penicillin, tetanus and antiseptic sprays. "She is only just starting to walk again today," she said. "She's only three, still a baby, and she's finding her feet so this has knocked her a bit. "Our other horses are distraught as well. We have one really friendly horse who is always coming up to us for pats, but since Friday she has been stand-offish."